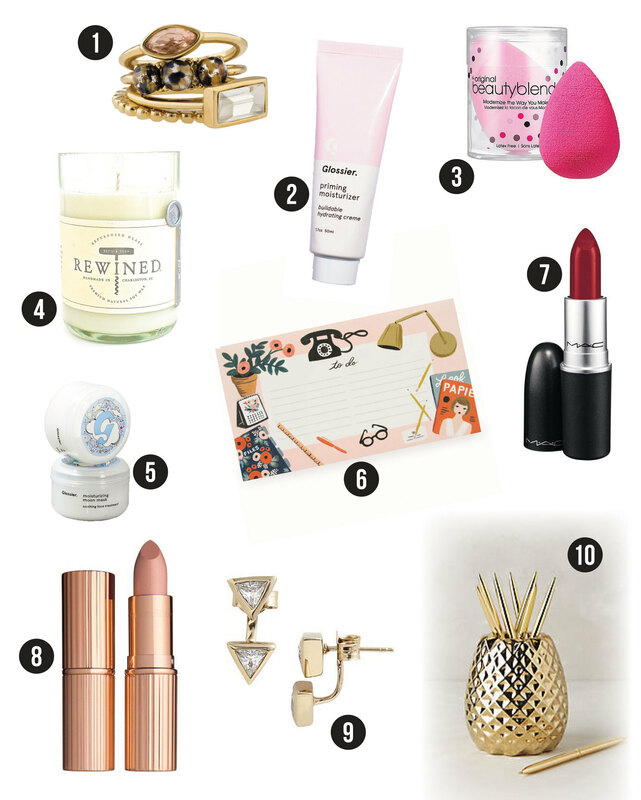 What the heck is a fashion / lifestyle blog without a holiday gift guide?! I mean really people, that is like Christmas with no Santa Claus. So, my friends, I bring you a few little gems for the women in your life. Everything is under 70 bucks and include some of my favorite brands right now. These items are perfect on their own as gifts or coupled together as stocking stuffers. You can shop everything via the links below. Happy Gifting! Capwell+ Co Confetti Stack Ring – Their jewels are to die for. You HAVE to check out their holiday collection, it’s insane. Glossier Priming Moisturizer – I use this product every single day. If you haven’t discovered Glossier yet, then you are seriously missing out! Their moisturizer doubles as a primer and is a beauty staple. Beauty Blender – Oh holy grail, how we ever lived without you is beyond me. Every female you know should be gifted one of these bad boys this holiday season. ReWined Candle in Rosé– These candles are the absolute best. I love the rosé and champagne flavors, but they are all amazing and come housed in re-purposed wine bottles. Guys, these are on sale now on Hautelook. Glossier Moisturizing Moon Mask – I couldn’t help myself. The moon mask is the perfect beauty gift if you’re looking to help pamper a certain someone. Busy Day Notepad by Paper Crown + Rifle Paper Co. – This stationary is too damn cute. I found this notepad at Anthropologie during my black friday escapade. Mac Lipstick: It’s no secret that Mac is one of my favorite cosmetic brands. Some of my go-to lipstick shades are Ruby Woo, Diva, Velvet Teddy and Stone. They also make great stocking stuffers. Melinda Maria Earrings : I just discovered this jewelry brand and am in LOVE. Their pieces add just the right touch of edginess to any outfit. A must-try. Pineapple Pencil holder: This little desk bobble is in the shape of a pineapple, need I say more? Oh, and no one likes a boring office space. Enter, desk charms!